The Clash of the Titans begins in less than 12 hours. 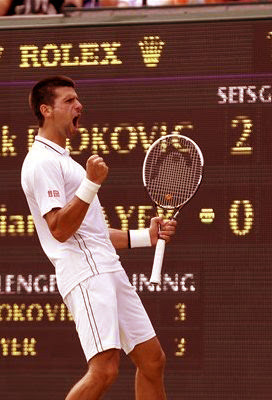 Novak Djokovic, 25, world nº 1, faces Roger Federer, 30, considered by many as the greatest player of all time. Wimbledon will be packed, Twitter will go mad, audiences all over the world won't miss a thing on television. This will be the 27th time they will play against each other: Federer leads with 14 victories to 12. Adding to all the build up that surrounds a Wimbledon's semifinal match, Today's clash has much more at stake than a simple win. Federer has a chance to become world no.1 again if he goes on to win the tournament. Djokovic won't be dethroned that easily, therefore we can expect a five-setter match and an intense battle on Centre Court! Another interesting fact is that in 27 matches none happened in grass. It will be the first. The Swiss said to the New York Times: “We know our matches on clay, outdoors and indoors, on hard courts. But we don’t know what it’s like to play on grass.” While the Serbian explained to the Times of India that "maybe Federer uses the grass court better because of his slice". "He has a really smart game for this surface. But I have improved playing on grass in the last couple of years. I won the title here last year, got to another semi-final this year, so I’m feeling good about this surface, about myself on the court. I really have nothing to lose", added Djokovic. Another chapter to add pressure to this SF is Federer's chance (probably one of his last opportunities) to write his name in one more record. Fed said in the beginning of the season his goal was to become number one once again. If he accomplishes it and stays in the top for a week, he will break down another Pete Sampras record (the American was 1-ranked for 286 weeks). That said, tennis experts point to another Novak Djokovic's victory. Recent trends show that the Serbian has better chances since he won six out of the last seven matches between the two. Federer's only victory happened last year in Roland Garros semifinal. The Wall Street Journal has a very interesting article explaining "why the Swiss Maestro isn't going 'All In' to win his first Grand Slam title since 2010". 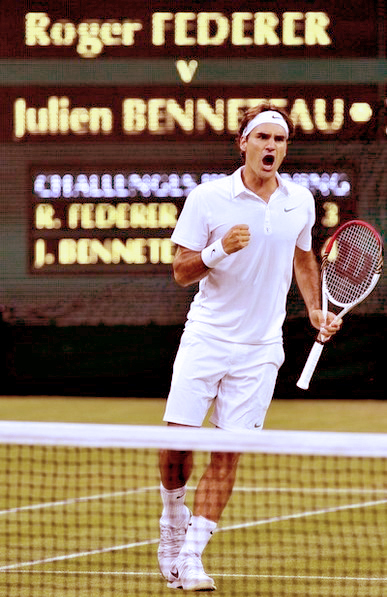 "They have never played at Wimbledon or on grass, and they are meeting at exactly the wrong time for Federer. He turns 31 next month; Djokovic turned 25 in May. Djokovic won Wimbledon last year and has played more aggressively here this year without making more errors. Federer, meanwhile, is moving backward—literally", concludes WSJ's staff writer Tom Perrotta. The second semifinal will be between France's Jo-Wilfried Tsonga and Britain's Andy Murray. Playing with the crowd on his side, and enjoying the fact that Rafael Nadal is already out of the tournament, Murray has an incredible chance to be the first British tennis player to reach a Wimbledon final in 74 years! Second semifinal starts not before 4 PM, local time.